So I know I’ve been talking about Periscope a lot. And that might be because I’ve fallen madly, madly in love. I never thought I would like live video. And honestly, the first week or two I got on Periscope and started regularly scoping, it was way, way outside my comfort zone. But folks, I have never been so excited about another social media platform. And I know exactly why: I love that it’s real-time. I love that I’m connecting with you live. I love that it allows me to be more real than I can ever be with words on a page. Yes, it’s not as polished or edited as a blog post. Yes, I can sometimes get off track. Yes, I sometimes say something incorrectly or say “um” or “and so” as filler words too often. Yes, there are some scopes I’ve deleted from the replays on my Katch account because it felt like I just went around and around in circles. And yes, there are almost always trolls that I have to be vigilant about blocking. But all of these negatives don’t change the fact that Periscope allows me to connect with you all in a much more authentic, deep, real-life, and meaningful way than I ever have been able to before. And I just LOVE it! I love . He is an amazing writer and marketer, he is quirky and funny! He does such a fantastic job at creating community in his tribe. In fact, there are words and phrases used in the Jon Acuff tribe that would make absolutely no sense and look like a foreign language to someone who is not in the tribe. That’s how much of a community he has created. It’s inspiring! He is also a real-life friend of mine who lives here in Nashville. I love seeing how his real life mirrors his online life with authenticity and integrity. If you are a homeschool mom, I think you will absolutely love Kristi’s scopes. She is fun, hilarious, energetic, and super enthusiastic! I met at a conference a while back, and she gave me SO much great advice as a newbie scoper. I have learned infinite amounts of valuable information from watching her scopes. If you are thinking about jumping in and starting on Periscope, check out her new book for inspiration on how to make the most of Periscope. is actually the person who inspired me to start scoping in the first place. She convinced me of how powerful of a community engaging tool Periscope can truly be. Most importantly, she is a great example of how to use Periscope to give people such incredibly valuable information. I find her business and confidence scopes to be hugely helpful in my life. 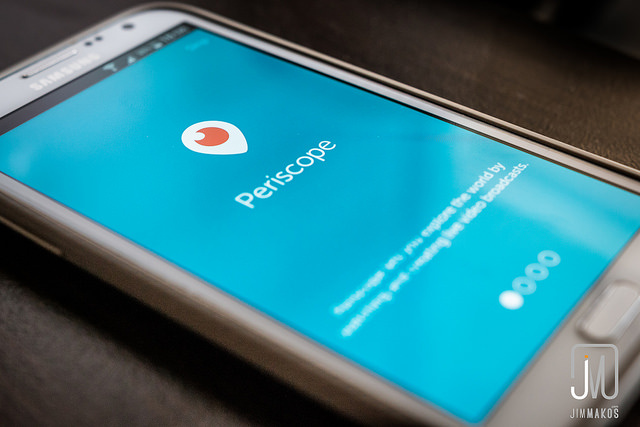 Want more information on getting started on Periscope? Download her . is a homeschool mom, and she is such an inspiration to me as a wife and mom. When I first sent out an e-mail to my followers asking if anyone uses Periscope, I received a reply from Mackenzie telling me she had been a scoper for a while on her morning show . I get a lot of e-mails from people telling me about their products, shows, and blogs. I check them out, but most of the time I find that it’s not something that is a perfect fit for me. But I checked out Mackenzie’s show, and I fell in love! Every morning between 6:30 and 7 PT, she scopes on her morning show to encourage Christian moms in how to cultivate loveliness in your home. It is very encouraging to find ways to make the seemingly mundane a little more lovely each day. Which scopers do you love to follow? Leave a comment and let me know! P.S. Thinking of trying your hand at Periscope? Watch my video on . She’s SUCH a hoot, isn’t she??! I love Christine Caine on Periscope and Darren Rowse from ProBlogger rocks it! I’d love to get better at it myself. Thanks for the AWESOME video! My favorite right now is Jennifer Rothschild! I follow you and Jon Acuff, too. I can’t catch you in the morning because I’m busy driving kids to school. I do like that I can replay videos I’ve missed. Well, I follow you of course, Crystal! I also check out Erin at the Humbled Homemaker, and I follow MacKenzie at Bold Turquoise, as well as the owner of The Dating Divas. I have loved how much fun it is to connect with you on Periscope, that I have been scoping daily to connect with my audience….well, until I lost my phone. 🙁 I’ll have a new one soon and I’ll be back in it. Awww! Thanks, Keelie! I LOVE interacting on Periscope! I’ve had a busy couple of weeks with some special meetings, so I haven’t gotten to scope in a few days. I hope to be back soon. I am so sorry you lost your phone!!!! I hope you find it soon or can get a new one! My phone is gone forever. 🙁 I have a new one on order. Hopefully it will be in tomorrow or the next day. I hope I get back in time to catch you! Oh man!! That stinks!! 🙁 But I’m glad you’re getting a new one! I love to speak to my audience through video. We have done youtube videos for years. I have really enjoyed Periscope, although I am struggling with it right now because of the connectivity issues I have in the country we are currently living in. Sarah Mackenzie at Amongst Lovely Things. Love all of her scopes! So encouraging and inspiring! I love listening and watching Scopes, it feels more personable to me and like my favorite bloggers are my friends. Lol. I follow December212012, Erin Odem, Megan Stevens, among others but these are the ones that I watch most often. Thank you. I have not downloaded periscope. I thought it was just like skype but obviously it has more to offer than skype. I always learn so much from you Crystal. I enjoy Emily Freeman when she scopes. Some others I have enjoyed are Ruth Soukup and Jessica Turner. Of course, I love watching yours too. I usually don’t have time at work to watch them live, but I try to catch the replays or watch on katch later. What a fun surprise! Thanks so much Crystal!! I feel like I need to echo the suggestions here! I love all the scopers mentioned in these comments! I think that is something that people show take note of — the power of Periscope in the Christian community! I’ve been so inspired as a mom, wife, and homeschool mom through so many people’s scopes! I love that people are sharing their real lives and encouraging others to keep pressing on in the faith! A few others on my personal favorites list: Amiyah Martin, Brilliant Biz Moms (Beth Anne)-she’s doing a book club on Money Making Mom, Emily Freeman (when she gets on), Michelle Myers, & Amy Wyler. 🙂 All of these ladies are so encouraging. LOVE these suggestions! And love you, friend! I have to say that Erin Odom and you, Crystal, are the ones who got me hooked on Periscope! My hubby laughs at me, but he’ll watch you guys, too. (He loved the scope you had with your husband). Also I like chalene Johnson and Kim garst . i’m not very tech savy, so how can i watch a periscope?